Bradley Turn Dates: Is the Stock Market in the Stars? 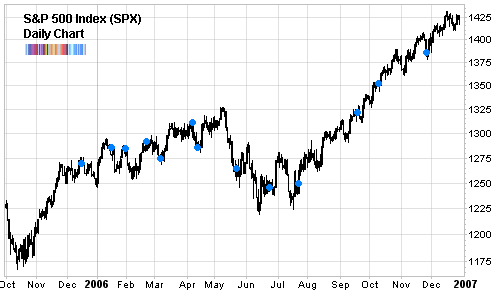 The Bradley model is a strange sort of stock market indicator. It was invented by Donald Bradley in 1948 as part of his book “Stock Market Prediction — The Planetary Barometer and How to Use It”. I won’t go into how it is calculated. All we need to know is that unlike earthbound indicators like the RSI or the MACD which rely on price as an input, the Bradley model is based on the movement of heavenly bodies. And because of this, it can be calculated months and years ahead of time. The signals are called Bradley turn dates and are meant as guideposts of trend change not direction. Since the Bradley “siderograph” (literally: star chart) looks like a price chart with smooth sloping lines going up and down this can be confusing. 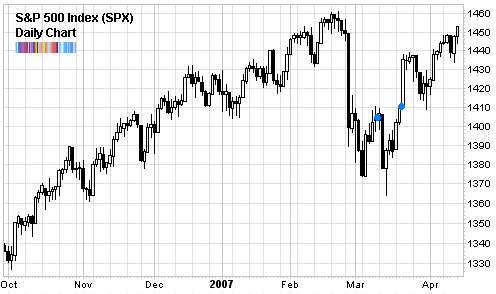 So just remember: the turn dates are only indicators of a change in trend - not direction. So while the Bradley model may ‘turn’ down, the market may go up. If the market had previously trended lower, then this would be a successful signal since there was a trend change (from down to up). The important thing is to realize that more people follow this sort of astrology based indicator than would ever publicly admit it. That includes some people managing very large amounts of money. I suppose in the end we are all a bit superstitious. It doesn’t hurt that some Bradley turn dates are eerily accurate. But is this due to simple random chance? or is there something real behind it? As far as I know, no one has done a full scientific study of the Bradley model. I don’t blame them either. It can get quite messy since no one even really agrees on the proper way to calculate it! And the experts in this field are more into the interpretation of the signals than their production. I suppose it is similar to technical analysis. Trying to scientifically prove it or disprove doesn’t lead anywhere except madness. The last time I wrote about the Bradley model was in May 2006 when I pointed out a Bradley turn date had occured. If you really are interested in the intersection of astrology and financial markets, then Arch Crawford is your man. He runs a newsletter called Crawford Perspectives which is the only exclusive astrology based one tracked by Mark Hulbert. According to Hulbert, Crawford’s record is spotty at best with a few good ’streaks’ of performance. You can check out a sample newsletter from Crawford Perspectives here (September 2006). What would the Bradley curve look like plotted over top of the NYSE ? What would a bottom panel on the chart look like displaying the ratio of NYSE/Bradley ?? It occurs to me that a correlation of the accelerations of the Bradley to the price accelerations would be very useful.